Saint Thomas Church, Goodness and Gentleness (1930) Stained Glass Window by James Humphries Hogan of James Powell & Sons (Whitefriars), Ltd. This window is in the Chantry Chapel also known as The Lady Chapel, which is dedicated to Our Lady, Saint Mary the Virgin. There are four windows in the chapel-all in honor of women in the Scriptures. One window was completed in 1929 and the other three in 1930. This window is Goodness and Gentleness. On the left side, which represents Goodness, is Saint Agnes and Saint Dorothy represents Gentleness on the right side. 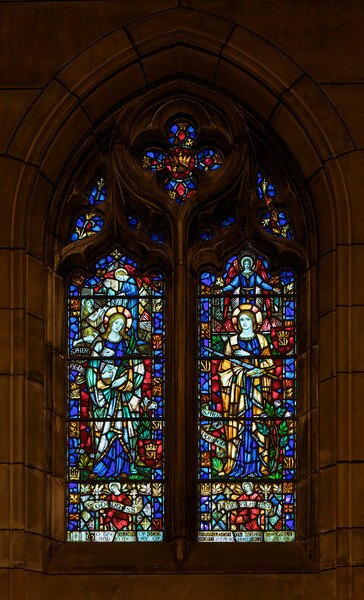 The four windows were made possible by donations from the Burden family. Thanks to David Daniel at Saint Thomas for information on the windows.